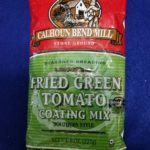 Cajun Flip N Fry – You’ve GOT to love fried foods. But hate having to clean up afterwards? Batter up! Those shrimp, pieces of fish, onion rings, pork chops, or ANYTHING to be prepared for coating! You’ll love this “NO MESS” batter container. 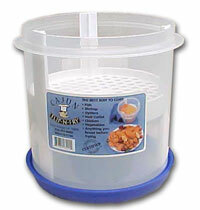 Keeps FISH FRY, FLOUR, BREAD CRUMBS, etc. separate from meat or vegetables being prepared. Shake to batter, turn over to sift…and your done. 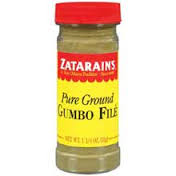 Keep the mess in this sealed container and NOT ALL OVER YOUR KITCHEN! 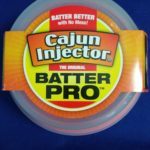 The Cajun Flip N Fry has a large 1.25 gallon capacity container, big enough to batter 8 to 9 – 8″ filets or 1 lb of shrimp at a time. The Flip N Fry is not cumbersome to use. It is easy to hold onto; even a child can use it. The lid fits tightly so it will not leak batter, which means no mess to clean up. The design of the Flip N Fry makes it convenient to store either in a cabinet or a side-by-side freezer. Step 1: Place fish fry, flour, etc. in bottom of canister, place food to be coated on top of basket. Step 2: Close lid tightly turn upside down and flip back and forth. Step 3: Evenly coated food is ready to fry. Be the first to review “Cajun Flip N Fry” Click here to cancel reply.